There are red IPAs. And then there's Wolf of the Willows' Wolf Blood. The beer originally brewed as a collaboration with Brisbane's fine Bloodhound Bar for its Hopfields event in 2016 returns a year later, this time bottled too so more people can get their hands on it. So, why did we open this piece as we did? 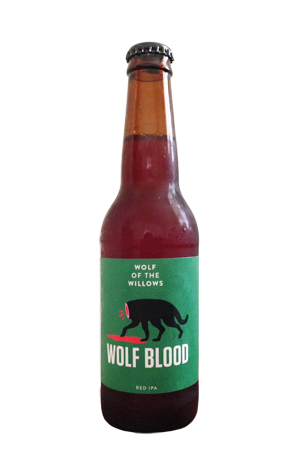 Well, brewer Scott McKinnon has done so marvellous a job combining specialty malts that the beer pours such a bright red we went rushing straight to the notes sent by the Wolves to check they hadn't loaded it with hibiscus or something similar. But nope. They haven't. He's just worked some brewing magic. As for the beer itself, there's plenty of hops in there – mostly American although joined by relatively new Aussie hop Melba – and they deliver plenty of citrus and pine aromas, not to mention a potent, drying bitterness. And, as tends to be the case with WOTW beers, it's lean too, although not to the point you don't pick up the toasted caramel malts. The label's worth a mention too: how many businesses would decapitate their own logo and leave a bloody pool behind?